The look and feel of your party is a very important part of your guests' perception of the event. If you really want to set your party aside from the rest, order one of Ice Luge Doctor's decorative ice sculptures. Located in Long Island, New York, we can add a sense of originality and creativity to your special event. Ice Luge Doctor is an industry leader in ice sculpture quality, providing competitive pricing and outstanding customer service. Our professionals work with you to create the exact sculpture that you want. We make wedding ice sculptures as well as pieces for corporate and religious events and birthdays. Let us turn your party into an event! Special orders are welcomed. 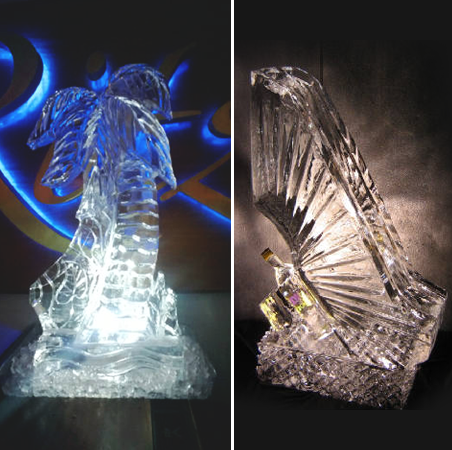 When you want to personalize your event, we can put a special engraving in your ice luge or sculpture. We create both simple and dramatic ice sculptures. Call us and share your ideas, and we'll easily make your event more fun and memorable. Almost any of our ice sculptures can be converted to luges; we just drill a path through the sculpture, placing a funnel at the top. Our prices start at under $100, and we conveniently deliver them to a location at the time of your choosing. You may also pick up your ice creation at our Long Island, New York, location. Contact us for more information. Our prices vary depending on what you're looking for and where and when the party is located.